不可算名詞 [個々には 可算名詞] ケーキ，洋菓子 《★ナイフを入れて切ったものは 不可算名詞 で，a piece [slice] of cake ケーキひと切れを用いる》. Bring us two fruit cakes. フルーツケーキを 2 つ持ってきてください. You can't eat your cake and have it (too). 《諺》 菓子は食べたらなくなる 《同時に両方よいことはできない》. a cake of soap [ice] せっけん[氷] 1 個. His shoes were caked with mud 彼の靴には泥が固まりついていた. I am fond of cake. She ate two pieces of cake. 成句You cannot have your cake and eat it. 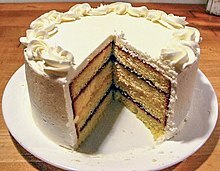 Cake is a form of bread or bread-like food. In its modern forms, it is typically a sweet and enriched baked dessert. In its oldest forms, cakes were normally fried breads or cheesecakes, and normally had a disk shape. Determining whether a given food should be classified as bread, cake, or pastry can be difficult.